"At last... having tried for 18 months to develop teamwork .. They are now making their own decisions"
You believe that people are truly your most important asset, but are you unlocking even a small fraction of their true potential? Do you focus on adding-value to your "human assets" to anything like the extent that you focus on utilising the "capital assets" of your business? You have been charged with developing the critical foundation blocks of career development for your newly appointed managers or your recent graduate intake. You know it will be hard to hold their attention, you remember what it was like for you shortly after you finished studying and wanted to get stuck into relevant business work. You know that this is important but needs to be personally relevant, highly engaging and focused on the real business they work in. You know where you want to get to….But you don't know how to get there. You need them to build self awareness and to understand their impact on others, particularly on the older people that often work for them. It is important they understand how trust is the key to effective relationships and effective organisations. They should know their preferred learning style and what it takes to be an effective team player. Taking responsibility, often without authority is high on the agenda and it is vital that they learn about setting priorities and clearly defining their own purposeful approach. You want them to engage in "win-win" behaviours through effective communication, to value differences and what motivates themselves and others. And if this isn't enough you know that they will not be engaged unless the learning is also fun. Not much to ask then? In the age of empowerment, responsibility for others is being devolved to younger and less experienced mangers. In making the transition from academic life to the business world, new recruits need to learn how to manage others and make mature decisions. Our personal development programme accelerates this learning, enabling them to adapt more quickly to their new role. 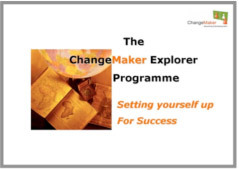 The programme helps to develop confidence, create self- awareness and improve interpersonal skills. "It's a journey into yourself... Not a hike up a mountain!" "Great opportunity to challenge yourself with risk free support and reflect on your internal core. Great networking and fun." "Great and inspiring. You can see yourself from a different angle." "Eye opening course to help one define strengths/weaknesses in real life situations"
"Unique opportunity to reflect and recharge. To develop and hone your leadership skills – that can impact your work and personal life. A competitive advantage for our company"
The facilitated reviews draw parallels to life in the business and create the leverage and the commitment for the application back at work.